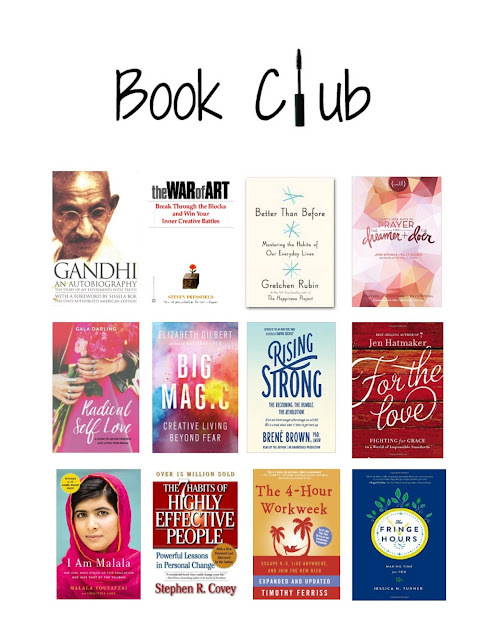 I am BEYOND excited to share with you the start of Life in Mascara Book Club! Reading is something I am very passionate about and for years I have longed to belong to a group where we could all read together and discuss. For one reason or another, that never happened. When I started my blog, I began to share over the course of this year the Pop Sugar Reading Challenge I decided to do. More and more I began to get excited about reading and sharing my thoughts with this community. Finally one day I though 'We are our own book club'. Search no more! I also want to share with you why I choose these particular books. As I have shared many times with you, I am working towards incorporating more positivity in my life. I want to be more productive, open hearted, and purposeful in what I do. In going over in my mind what my word for next year will be (this year was 'Present') the word 'Do' popped into my mind. I took it as a sign towards wanting to do more things that fill my heart and my mind. With that I decided that the books we would read would be along these lines and so I went in search of that. The image above is set to the books we will read from left to right. I have sized them up for you according to MAMBI The Happy Planner boxes and can be downloaded here. Each month we will read the book of the month and then we can discuss it on the last Friday of the month on my YouTube channel. I hope you are as excited as I am to start on this journey. Let me know what you guys think! Oh, and here are the links to the books in case you want to place one order. I'd full-heartedly join your club! I have a Happy planner too, and I can't wait to collab with you. That's great! I can't wait to start!